Although the Man of Steel had long since passed away, his courage, strength and vision lived on to inspire all those who abhored injustice and corruption. The Kent tradition was carried on by his remarkable offspring, the sons and daughters of Superman. In his honor, a constellation high at the edge of the known universe was named after him! 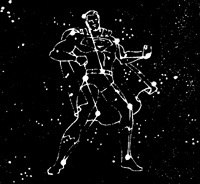 As the centuries passed, generations of supermen contributed to man's conquest of the stars! During the millennia, their inherited powers diminished as bloodlines crossed and recrossed with humans! Earthmen, however, continued to evolve, their abilities increasing to super-normal intensity! New and fantastic technologies were developed that sent the explorers ever deeper into the blackness of space. Their efforts, which took a heavy toll in lives and souls, were justified when Earth's life-giving sun flared nova and burned her tiny satellites to cosmic ash! Man escaped with no time to spare! For the next seven million years, man and supermen colonized the heavens! They were propelled by time-drive thrusters, anti-grav devices and warp-space engines. The supermen developed a series of new powers, including the ability to transform their body masses into pure energy! Called the Aurora Ray Conversion or ARCing, it allowed them -- as spheres of radiant light -- to travel individually through the universe. Many were never seen again! The stars watched without concern or passion! 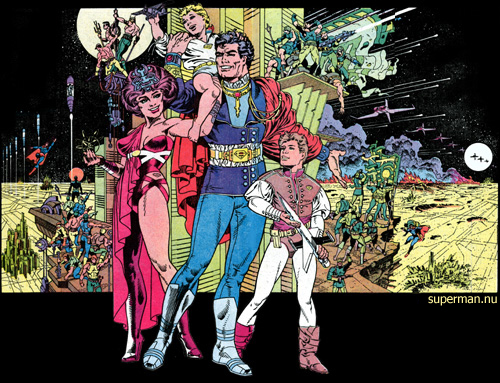 As the space-settlers conquered myriad worlds, they took root, built environments and raised families as their fathers had done an eternity ago on the plains and mountains of Terra! There was great joy and great pain, the strong, the cunning and the daring found wealth and fame! Minstrels sang of their exploits, from the Magellanic Cloud to Perdition's Horn! The weak, the foolish and the fearful died of battered bodies and broken hearts. The stars did not mourn their passing! Politicians organized the expanding societies! Empires prospered as alien worlds welcomed their visitors! Often boundaries were violated, and wars were waged which leveled planetscapes as far as the eye could see! Death was commonplace, but man continued to prosper despite the anger, jealousy, greed and malevolence of his brothers! The stars did not judge their actions! As the starmen continued to explore the heavens, they solved many cosmic paradoxes, including the shape and perimeter of space! Measured by the physical laws of length, breadth, height and time, the concept of the galaxy bending back upon itself like a moebius strip was proven and charted. Continuous travel along the plotted celestial lanes allowed travelers to return to their starting point! Violating its edges was dangerous and forbidden by universal decree! What lay beyond the realm of space was an impenetrable mystery with which no being wanted to tamper! The forces maintaining the boundary at the edges of space were of another dimension, colonies near the borders were few, but mining stations run by worker robots were common. One such outpost, in a system at the high rim of the universe, had been excavating precious ore for a thousand years before the accident happened! While every mining operation was equiped with an automatic defense system designed to deter claim jumpers, this unit erroneously identified a meteor shower as an enemy raid, and retaliated with a barrage of atom particle destroyers. Although some of the runaway meteors were blown to neutrons, others continued on their course -- relentlessly tracked by the APD missiles! Then, somewhere near the edge of the universe, they exploded, tearing a jagged rift in the very matrix of physical time and space. A terrible shockwave hammered the cosmos as reality poured through the opening, disappearing into total oblivion, leaving only the brightness of nothing and the deafening thunder of silence! Suns, planets, asteroids and the awesome void between worlds vanished into nothingness, swallowed ravenously by the vortex as it spread with demonic speed throughout the universe. All intelligent life watched the sweeping annihilation with incredulous horror -- knowing their existence was doomed! Fear drove many to suicide! The most courageous swore to die resisting -- and called upon the brotherhood of supermen to spearhead the cause of mankind! The vortex continued devastating the universe, while every effort was made to measure, define and anlayze it -- all of which ended in failure! There was nothing to interpret... ABSOLUTE ZERO! Of the many theories suggested, one which described the effect like a retaining wall in a huge dam with a hole in it seemed most likely. If the hole were plugged, they reasoned, perhaps the vortex could be stopped, even reversed! Only a force of ultimate energy and density could be harnessed for the purpose! The supermen agreed that ARCing might unleash enough raw power to make a difference -- and revealed their technique to every remaining being in the cosmos. Their plan was simple: to unite all life into a cohesive hole and plug the dimensional wall. While all civilization prepared for the action, the supermen attempted to determine the core of the vortex -- with no success! Then, A'dam'mkent+477SPMN, the blind poet who sailed in the fury of the solar winds, came forward! He claimed that by focusing his psychic vision on the Superman constellation -- which no longer existed in reality -- he could pinpoint the heart of the vortex! He was their only hope for survival! Within three months, humanity was ready, every being in the universe would convert simultaneoulsy, converging into a billion units! The billion then merged into a million, which coalesced into a thousand, and finally to ten! Every existing soul transcended its mortal condition to become a being of inexorable energy! Then, A'dam'mkent was the only man in the universe! A state so bizarre and awesome, it drove him to the brink of insanity! His mind and body were numb, tortured into madness by the sacrifice of mankind and the great pain of his isolation! Suddenly, something deep within his spirit compelled him to encase the ten final conversions in capsules, and begin his journey to the edge of the vortex! When his ship was in position, he fired all but one of the capsules into the churning nothingness! The weight and immensity of A'dam'mkent's responsibility crushed the life from his body and soul until he sank to the ship's cold floor! He did not know how long he was there, hovering on the razor's edge of eternity! Suddenly the universe blazed with searing energy, and a tidal wave of force propelled the ship backward into the solar blackness, with the velocity of a comet, it hurtled through heavens, year upon year, until, by coincidence, its trajectory smashed it to pieces on a tiny uninhabited world! The ship's protective field cushioned the crash and saved the life of its sole occupant! The ARC capsule buried itself deep in the heart of the planet with its impact! A'dam'mkent lived! Time, however, had no meaning for him -- he knew his torment would be forever! He wandered aimlessly into the lush paradise, always returning to the wreckage! Somehow, he had lost his extraordinary powers as his vision had returned! His torment was complete each night when he looked up at the ebony sky! It was as it had been before the terrible cataclysm, a sheltering dome dotted with a million lights! The life ray of the capsule bored like a beacon into the peaceful expanse above! Had he saved the heavens to create his own personal Hell? He shouted his agony at the twinkling stars until his tears dampened his cheeks, clouded his vision. What good was the universe with its great majesty and endless freedom without other life to share the joy and pain of existence? Then, as though in answer to his unspoken question, there was a movement from the shimmering column of light! A figure appeared, bathed in eternal radiance! And in her eyes, he discovered the future! A'dam'mkent had found his Eve! Dedicated to Julie Schwartz -- gentleman, editor and friend - J.S.